Electronic cigarettes are best enjoyed with an e-Liquid in a flavor that you enjoy. E-Liquid can be flavored to fit any mood or taste. In fact, thousands of e-Liquid flavors are available on the current market. When it comes to the variety of available e-Liquid flavors, the sky is the limit. 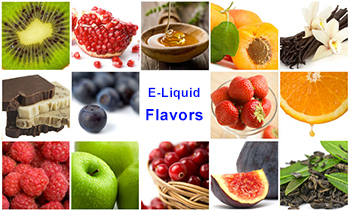 E-Liquid flavors vary widely from cigar and tobacco flavors to sugary and sweet flavors. Some flavors are created to mimic traditional cigarettes, such as menthol and tobacco flavors. Other flavors are designed to simulate fruits and common sweet treats, such as chocolate, strawberry, vanilla and coconut. Then, you have the more exotic flavor options, such as strawberry daiquiri and Boston cream pie. When deciding which e-Liquid flavors you want to try, consider the flavors that you think will satisfy your personal taste buds. For example, if you smoke menthol cigarettes before making the switch to e-cigarettes, then you may want to start with a menthol flavor that is refreshing and delicious. If you want something a little more, try adding a fruity flavor like banana. Many who vape choose their e-Liquids based on their moods. For example, if you want a little lift, then chocolate and vanilla should do the trick. At other times, such as after a tasty dinner, you may find cherry and strawberry flavors to be most delicious. When you are in the mood for a flavor that is fresh and crisp, the mint will be a great choice. If you are new to using electronic cigarettes or are sampling a new vendor, it is a good idea to try a minimum of three or four flavors at first. This will help you to determine the types of flavors that you like the best. Then you can begin to narrow it down to the e-Liquids that suit your particular tastes. Keep an eye out for special deals, such as sampler packs or variety packs. These will make it possible for you to try a number of different flavors in smaller amounts. Do not be afraid to mix it up from time to time. You may find that combining some flavors is a great way to discover completely new flavors that you love. For example, try mixing your strawberry flavor with banana, or apple with whipped cream to delight your taste buds. It is likely that you are going to spend much more time looking for the ideal e-Liquid flavors than you spent choosing your electronic cigarette device. Compared to e-cigarette choices, you have many more options when it comes to choosing the e-Liquid that you use with them. Some people want to have more vapor, while others are in the market for more flavor. What you want to get out of your vaping experience is completely up to you. Once you begin trying flavors, you are sure to discover your own personal preferences and the exact tastes that you desire. Many different high quality e-Liquids are available at a reasonable price. Most manufacturers take great pride in the creation of amazing flavor concoctions. So try as many as you like to find your favorites.